The minigun in Grand Theft Auto: Liberty City Stories and Grand Theft Auto: Vice City Stories. 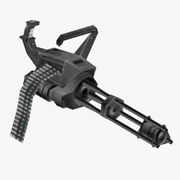 The GTA Vice City and GTA San Andreas renditions are based on a man portable version of the M134 Minigun, while the GTA Liberty City Stories version is based off the M197 tri-barreled Gatling. It has an incredible rate of fire and can annihilate most vehicles in almost less than a second around a certain radius. In Vice City, the minigun mows down targets level with the player; however, it is impossible to aim manually. Instead, it shoots upwards automatically to e.g. helicopters, similar to the Rhino. In GTA San Andreas, thanks to the new aiming system, it is possible to aim the minigun in any direction, making shooting higher targets much easier, but also dangerous if the target aircraft may explode and fall on the player. It is almost 100% accurate as there is no recoil, but it can't lock on to a target which isn't much of a problem due to the very high power of each individual round and the amount of ammo it carries. In GTA Liberty City Stories and Vice City Stories, the player can both lock onto a target and shoot manually with the minigun. GTA Advance and Chinatown Wars also feature the minigun as an available weapon. In GTA Chinatown Wars, it is the most expensive weapon in the game, costing $10,000 from Ammu-Nation. Also, the minigun in GTA Chinatown Wars is powerful enough to split a person in half if shot at a pedestrian. For GTA IV, the minigun was planned to be the second heavy weapon, the first one being the rocket launcher, but it was dropped in the end, due to unknown reasons. By using the remaining data in-game, it appears to carry a 750-bullet load and to be able to kill any person (armored or not) with one shot, making it the most powerful weapon in the game. Miniguns are also mounted on Annihilator and Buzzard helicopters. Both fire normal 7.62×51 millimeter cartridges, but the Annihilator fires about 1,000 rounds per minute, which is unrealistically slow, by about 5,000 rounds per minute. This is probably to prevent helicopter pilots from being able to literally shred players and vehicles. In The Lost and Damned, the helicopters' top speed is increased and the minigun ammunition is replaced by highly explosive cartridges that make mince meat out of pedestrians, cars, motorcycles, and even other helicopters and boats. On the Buzzard, which only appears on The Ballad of Gay Tony, there are 2 miniguns mounted, which do not overheat or need to reload and fire about 4,000~6,000 rounds per minute. In GTA V, the minigun no longer has a fixed magazine size; the minigun will continue to fire whenever the player has ammunition. However, it is not as powerful as its previous renditions; destroying a vehicle requires sustained fire on the engine or fuel tank instead of simply aiming anywhere and firing only a few rounds. The player cannot sprint while holding the minigun, and it cannot be used from cover. The minigun makes a prominent appearance in the mission The Paleto Score, where Trevor Philips holds back crooked law enforcement and military while wearing bomb squad armor. Carl Johnson using the minigun at Las Venturas Airport. GTA LCS, and GTA VCS. Toni Cipriani using a Minigun. The minigun positioned on the side of the Annihilator. Trevor Philips using the minigun. GTA Vice City (mobile version). GTA Liberty City Stories, and GTA Vice City Stories. Little Haiti - On the top floor of the remains of the drug processing plant west of the Little Haiti Well Stacked Pizza Co. after completion of Trojan Voodoo. Little Haiti - Available to buy from Phil Cassidy's Place after completion of Boomshine Saigon ($10,000). Ocean Beach - Spawns inside the Ocean View Hotel after collecting 60 Hidden Packages. Downtown - Spawns on the roof of the Hyman Condo after collecting 60 Hidden Packages. Starfish Island - Spawns outside the Vercetti Estate after collecting 60 Hidden Packages. Kincaid Bridge, San Fierro - On top of the southern arch of the bridge. It's not accessible until the desert and Las Venturas are unlocked, because a ghost wall is blocking the player to get the weapon. Roca Escalante, Las Venturas - On the bottom-most level of an underground parking lot. Rockshore East, Las Venturas - On top of some scaffolding in the building site, requires climbing and jumping skills or a jetpack. Area 69, Bone County - Inside the base in a control room. The room is accessible during the mission, "Black Project"; if entered outside the mission using blue hell glitches, the player gains a 5-star wanted level. Tierra Robada, Las Venturas - Inside Mike Toreno's ranch after completing Vertical Bird. Vice Point - Can be bought from the Ammu-Nation shop after completing the storyline mission, Farewell to Arms for $15,000 but the price decreases to $11,500 if the player completes Phil's Shooting Range challenge. The minigun can be purchased at Ammu-Nation in Los Santos and Blaine County. Fort Zancudo - Found inside the Zancudo Army Base in Control Tower 1. In GTA San Andreas, there is a file called minigun2. This file can be seen using IMGTool. It's possible that this file could be a model of the minigun when it spins. It's also possible that this could be a different weapon entirely, dropped for unknown reasons during development. In GTA Vice City, using the minigun during the final mission, Keep Your Friends Close..., is a much easier way to defeat Lance Vance and Sonny Forelli. In GTA San Andreas, using the minigun during the final mission, End of the Line, is a much easier way to defeat Big Smoke. In GTA Vice City Stories, using a minigun, like in Vice City and San Andreas, during the final mission, Last Stand, is a much easier way to defeat both Diego Mendez and Jerry Martinez. This page was last modified on 29 June 2015, at 07:15.